There are some people in the video game industry that like to place all the blame for Nintendo's current financial and Wii U situation on Mr. Iwata, the current CEO of Nintendo Company and now CEO of Nintendo of America as well. Some of those people deny that employees and management in other regions for Nintendo, like at Nintendo of America for example, might actually be part of Nintendo's overall problem as well though. There is currently one Nintendo problem though, directly related to Nintendo of America's region, that I don't think Mr. Iwata made and might not even be aware that the problem exists. At least, I don't think he would have made this decision, based on one of his own more recent comments. It is a problem that Mr. Iwata now as CEO of Nintendo of America can hopefully address and get fixed though, for consumers and Nintendo investors. What problem do I think Mr. Iwata as CEO of Nintendo of America should fix? Brew yourself some coffee, and keep reading to see! 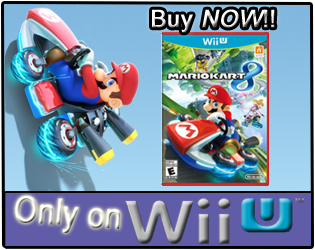 When Nintendo launched the Wii U this past holiday season, it was first available in the United States. I was the first person to pre-order the Wii U at my local GameStop the day they opened up pre-orders on the system, and I have enjoyed my Wii U system and the games I have played on it so far. What I don't understand though is why Nintendo of America has made the decision to not have the Wii U console available for consumers to buy DIRECTLY at its MSRP from Amazon.com, the world's largest online retailer. If more and more U.S. consumers are doing holiday shopping online and shopping online in general, I think that Nintendo of America would have wanted the Wii U to be available DIRECTLY from the world's largest online retailer, Amazon.com, during its first holiday season. Unfortunately though, it appears that an employee at Nintendo of America kept that from happening. Amazon's website for the United Kingdom sold the Wii U consoles DIRECTLY at launch, and still does. Amazon's website for Japan sold the Wii U consoles DIRECTLY to consumers at launch, and still does. Amazon's website for France sold Wii U consoles DIRECTLY to consumers at launch, and still does. Even Amazon's website for Canada sold Wii U consoles DIRECTLY to consumers at launch, and still does. 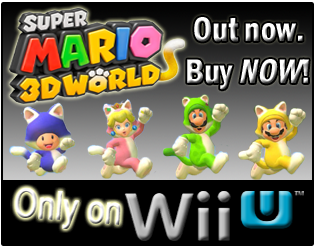 of the current Wii U Amazon. situation though. Amazon.com was the only major online retailer in the United States of America to not offer pre-orders or online purchasing of the Nintendo Wii U system this last holiday season. Still as of today (09/06/2013), Amazon in the United States does not DIRECTLY carry and sell the Nintendo Wii U to consumers at its MSRP. The Wii U system is only available from third-party vendors on Amazon in the U.S.A. Even the new The Legend of Zelda: The Wind Waker HD Deluxe Wii U Console Set is not available for pre-order or being sold directly from Amazon.com in the U.S., but Amazon in Canada is now taking pre-orders on it. Nintendo of America has now missed out on almost a complete year of Wii U sales and advertising on Amazon.com. Giving up basically an entire year+ of sales on the world's largest online retailer in Nintendo's most important home console region, before the other consoles have even launched this holiday season, doesn't make common sense to me, much less business sense to me. It isn't just the Nintendo Wii U Amazon.com doesn't carry and sell directly though, as the Nintendo 3DS, Nintendo DS, and Nintendo Wii systems have not been carried and sold at their MSRPs directly by Amazon.com in the U.S.A. for almost the last 2 years. I doubt right now that even the new Nintendo 2DS will be carried and sold by Amazon.com when it releases next month. This also extends beyond just Nintendo's consoles though, as Amazon.com does not even directly carry and sell the Nintendo eShop and/or Nintendo DSi/Wii Shop cards to consumers. What does this mean? Sony has their PlayStation Network Cards and Microsoft has their Xbox LIVE digital cards being sold on Amazon.com, and those digital cards from Sony and Microsoft have remained in the "Top 100" section of the "Best Sellers in Video Games" for more than a year now in most cases, helping both companies to sell digital content from their online stores. Nintendo hasn't been doing that, for AT LEAST the last 2 years. Nintendo has apparently given up selling Wii U/3DS and Wii and DSi eShop cards to consumers on Amazon.com, and has therefore given up many digital sales that would translate from those cards being sold online. but not Nintendo eShop cards. Why? Instead of grandparents, parents, husbands, wives, aunts, uncles, cousins, boyfriends, girlfriends, friends, etc., having the opportunity to buy Nintendo eShop cards as birthday gifts and holiday gifts for the Nintendo Wii U and Nintendo 3DS owners, Nintendo doesn't give them a good option for that on Amazon.com. Instead of consumers being able to go to Amazon.com, finding a Nintendo eShop card at MSRP on somebody's Wish List and buying it for them as a gift, Nintendo has completely given up that side of potential digital retail sales to its competitors, and that is very odd to me. I think that Nintendo has seen how important digital sales can be, and how profitable they are as well. Which is probably why Nintendo is now doing many more Nintendo Wii U eShop promotions, such as the upcoming The Legend of Zelda: The Wind Waker HD early Wii U eShop download starting on September 20th. So, why wouldn't Nintendo of America and Nintendo in general have the Nintendo eShop cards on the world's largest online retailer for consumers to buy? I think just as importantly though, if not more so, is if Mr. Iwata does not want to publish Nintendo developed games on the other consoles offered by Microsoft and Sony, then Mr. Iwata should make sure to keep Nintendo's own consoles in front of as many consumers as possible. Again, why would Nintendo of America, or even Nintendo in general, not want to have the world's largest online retailer selling Nintendo systems directly to consumers at their MSRPs? It doesn't make any sense to me, especially if we are concerned about the long-term future and profits of Nintendo overall. Which the last point is why don't I believe that you, Mr. Iwata, made the decision to cut ties with Amazon.com and not sell Nintendo systems in the U.S.A. directly from the world's largest online retailer to consumers at the MSRPs, in what has been Nintendo's strongest market for home consoles in recent years. Mr. Iwata, you recently told ComputerAndVideoGames in an interview that you didn't want to concentrate just on Nintendo's short-term profits, but instead you are responsible for the long-term future of Nintendo as well. I would agree, and that's why I'm writing this directly to you. If cutting ties with Amazon.com and not selling Nintendo consoles and eShop cards was a decision for the immediate short-term finances, it MIGHT make some sense, depending on the reason(s) behind the decision. But, if you are the Nintendo employee that has decided to not actively sell Nintendo eShop cards on Amazon's sites around the world though, can you please explain that decision? 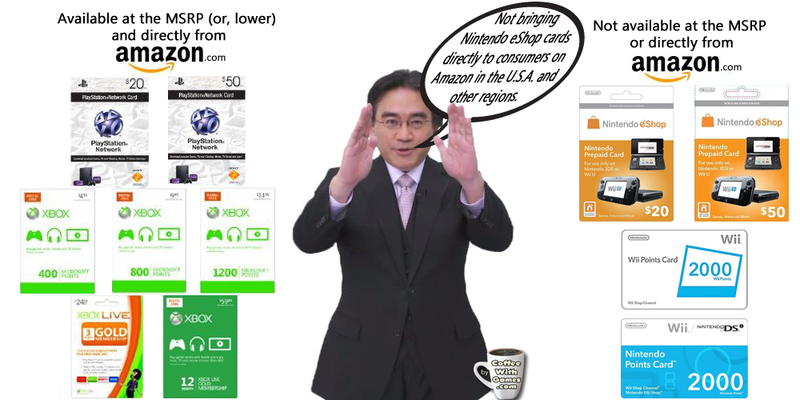 Does not having all current Nintendo systems and Nintendo eShop cards sold directly to consumers at MSRPs by the world's largest online retailer make sense for the long-term future and profits of Nintendo? I don't think so, unless you think that Amazon.com isn't going to be around in 5-10 years, or that fewer consumers will be spending money on online purchases. Whichever employee at Nintendo decided to cut ties with Amazon.com and not have Nintendo's Wii U and 3DS systems, and even the Nintendo eShop cards as well, sold directly from Amazon.com at their MSRPs, I think has done more financial harm than good for the company. It makes no sense to me, with more and more consumers making purchases online, to have your most important region in recent years for home console sales, the United States, not offering the Wii U and Nintendo 3DS systems (and Nintendo eShop cards) directly from the world's largest online retailer at their MSRPs. 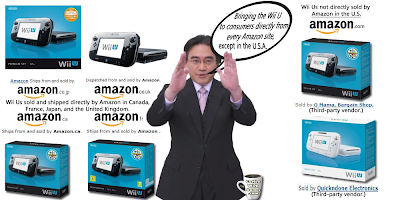 The current President of Nintendo of America, Mr. Fils-Aime, is aware of the Amazon.com situation, though he did not provide any details as to why the United States of America is the only country where Amazon's website does not directly sell Nintendo systems and Nintendo eShop cards at MSRPs to consumers, when he was asked about it last year. If you, Mr. Iwata, were the one that made the decision to cut ties with Amazon.com before the Wii U launched and apparently shortly after the Nintendo 3DS launched, can you please explain to investors why you think this is a smart decision for the long-term future and profits of Nintendo? If you weren't the Nintendo employee that made this decision, can you please let investors know which employee made this decision and have them explain why it was made? If you didn't make this decision and are going to try and fix it now that you are aware of it, contacting Amazon.com's CEO directly, Mr. Bezos, might be the best solution to finding out what exactly happened and why. 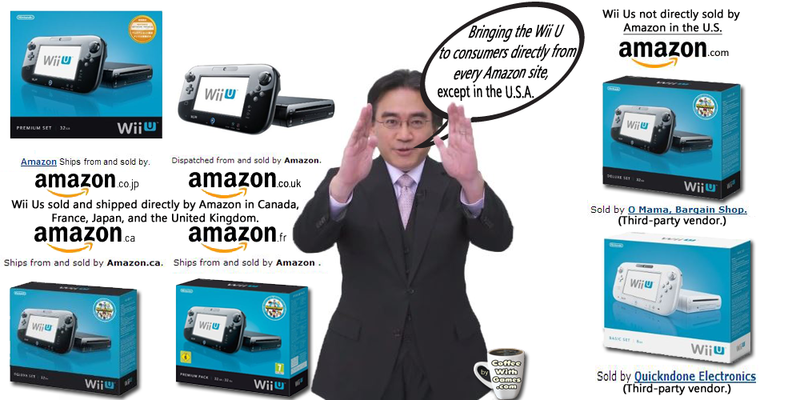 Mr. Iwata if you can fix the current Amazon.com situation in the United States and get Nintendo systems and Nintendo eShop cards on the site, I'm guessing there would be thousands of consumers (if not millions) to add them to their Amazon.com Wish Lists and/or purchase them this holiday season as gifts. Maybe you can even take it a step further, and allow developers to sell eShop codes for their games directly on Amazon.com, like what Nintendo has done for some Wii Virtual Console games in the past. Please fix this Nintendo of America problem with Amazon.com and get Nintendo systems and Nintendo eShop cards sold directly from the site at MSRPs, for consumers and Nintendo investors. I don't understand why Nintendo of America has apparently chosen to burn its console bridge with Amazon.com, especially considering they had a new console release last year. While Microsoft and Sony both have been using Amazon.com to promote pre-orders for their new consoles and games releasing this holiday season, and their digitial promotion cards remain in the "Top 100", it seems like Nintendo of America is happy with consumers having fewer places to buy and see their products. So, Nintendo of America had the worst Wii U launch ads, had the horribly run Best Buy E3 Wii U events speaking from experience, and doesn't have Nintendo systems and Nintendo eShop cards being sold at MSRPs directly by the world's largest online retailer? Why? Maybe they need more coffee at Nintendo of America? Maybe they need to hire more staff? Maybe the staff needs to work less, and perhaps could use some vacation time? Whatever the case is, something seems off at Nintendo of America to me, and I'm not sure how aware of the situation Mr. Iwata is, being that he just became CEO of Nintendo of America this year. Hopefully though, this issue will be fixed before this holiday season, and hopefully before the Wii U price drop later this month. If this is an issue you would like to see Mr. Iwata and/or management at Nintendo of America address, feel free to tweet this post to @Nintendo and @NintendoAmerica. Do you think Mr. Iwata was the Nintendo employee that made this decision regarding the relationship between Nintendo of America and Amazon.com, or do you think it was another employee at Nintendo? If you enjoy shopping online, as I do, do you think Nintendo of America should fix the problem with Amazon.com before this holiday season, or at the very least explain to consumers and Nintendo investors why Amazon.com is the only Amazon site (that I'm aware of) to not directly carry and sell Nintendo systems at MSRPs to consumers, only having third party vendors that do it? I've tried to find information on this and I've seen pieces on the major industry sites that show that even they can't get any info on what happened between these two companies, which is a pretty clear sign that whatever it was - it wasn't pretty. Both the PS4 and the Xbox One preorders started with Amazon this year, with both of them guaranteeing day one delivery - both sold out within 24 hours, if memory serves me well (I know the PS4 did). Nintendo not having a major placement on the largest shopping venue in the world, is indeed a problem and one that needs to be rectified ASAP. I doesn't appear that Nintendo is very worried about it though, which is worrying. This also flows outside of Amazon though, with major retailers in the UK dropping the Wii U console off of their shelves as well. I tend to anger some people with my criticisms towards Nintendo, but they are only there because I adore the company. With that said, I fear that there will be a time when its core franchise cannot sell one of its consoles alone, especially if they've been overused; this is where the Wii U currently falls into place, and Nintendo's decision to continue playing it safe - banking on a handful of games to sell its struggling console, without major marketing/advertising or proper conference presentations - is highly risky, especially with its lack of a fully integrated online structure in both its console and its games. Now, you can never write off Nintendo, but I do feel that might be some misguidance within the parent company. I don't point my finger at one person alone - the freedom to allow its first party games to develop side titles like HarmoKnight pleases me to no ends! - but I either there is misguidance within its headquarters, or this is yet again Nintendo's stubborn attitude to resist changing shining through. Either way, it has issues that need to be rectified and Amazon should be the top priority on that list! I thought Canada was experiencing the same issue... obviously, I was wrong lol. But yeah, this is a major problem and could definitely cause a lot of interested people to be turned away from purchasing the console. Hopefully, somebody gets on this right away. Well, Canada is taking pre-orders on the new Wind Waker HD Wii U bundle. Does Canada's Amazon site have issues with carrying just the 3DS systems perhaps? So, when the 3DS was first shipping from Amazon and people would end up with scratched screens for whatever reason....they would send it back to Amazon. Then, Amazon wanted to have the same benefits that Nintendo gives brick and mortar stores like Walmart regarding returns. If Nintendo did that, then that would upset the retail distribution, and they would likely ask for a larger rebate on the systems they buy and then Amazon would want the same and so on. Essentially Amazon got greedy, Nintendo said no....and Amazon decided to be dicks about it. Or so the rumor goes at least. It's weird that on Nintendo console pages, they advertise the Xbox 1 and PS4....but on those pages they only advertise those consoles. At one point on the 3DS page they had a chart comparing the specs to the Vita but on the Vita page there was nothing of the sort. Something definitely happened between them....I wouldn't put it squarely on NoA though...both probably are at fault in their own way. It might even be up to Amazon to step up....I have no idea. Well, if the problem was originally with the 3DS screens scratching, Nintendo should have given Amazon the same benefits of the brick and mortar stores, because the problem was on Nintendo's end with the 3DSes apparently. Amazon seems to always be on the customers side, and I have NEVER had an issue with Amazon, even when contacting them about stuff they didn't have to do (like price matching). I think the issue here, is that by Nintendo of America (or, Nintendo) deciding they didn't want to give Amazon the same benefits, it has hurt Nintendo and will hurt Nintendo in the long run. What does Amazon care if they aren't selling the Wii U and 3DS systems directly? Probably not a lot right now, especially considering Wii Us sales overall, because they make so very little (if anything) per system sold. I would actually argue that Amazon probably made more this last holiday season off of third-party vendors selling the Wii U systems (and even 3DS systems) on the site, than if they were selling the Wii U directly. Amazon gets a good percentage off each third-party item sold, so really the biggest loser in this situation, if what you say is true, I think is Nintendo for being greedy and not giving Amazon the same discount as the brick and mortar stores. Instead of consumers going to Amazon.com this last holiday season and seeing the new Wii U console at $299.99 and $349.99, they saw it above the MSRP. Maybe they graduated from college in the 80s or 90s, and could use an updated business course in online sales and why it's an important market? Or, maybe because Nintendo has been so behind the times with online (generally speaking), they didn't see the world's largest online retailer in their most important region for home console sales as being a necessary distributor? In Nintendo's greediness though (again, assuming all of that scenario is true), of not wanting to correct a problem Amazon was having with Nintendo's products, it affected Nintendo's long-term profits and future. Unless, we are thinking less people will be shopping online this holiday season, and next holiday season; but if that was the case I don't know why Nintendo is doing the eShop type promotions, instead of just focusing on physical game distribution. I mean, if Amazon in the U.S. was having issues with Nintendo products on the hardware side, and Amazon is the biggest online retailer, I don't see Amazon asking for the same return policy or discount as being jerks, as much as it is wanting to be treated fairly. The fact Nintendo has given up sales on Amazon.com and apparently Amazon sites around the world with eShop cards...just doesn't make any sense to me for the long-term profits and future. "...because Nintendo could sell a piece of cardboard to its fans." I agree with this, but if the Wii U has taught us a single thing, it is that even Nintendo fans have a limit on the amount of money they are willing to spend on its products. Completely agree on the price point of the DS consoles too - my wife has stated the same thing many times. I too was thinking about Microsoft's RROD situation when typing that about Amazon. You know good and well that it did whatever it could to satiate all the retailers' needs during that time, no matter the cost. It must, or it risk losing its support once the situation is resolved! Oh, I'm not trying to short-hand Nintendo in its support to the indies. It is doing a very good job, but just being perfectly clear - Sony has not only been doing everything that Nintendo is currently doing for the past five years, it also matched the development cost to the developer and GUARANTEED profits post launch. Sony's outreach to indies has been outstanding and it has done it, for the most part, without self praise and applause from the mainstream media. The reason that I support Sony, is because it is willing to take massive risk to have a wide assortment of titles on its consoles, regardless the cost. It likes to sell games, even if they don't shift but a million or so copies; I have a lot of respect for that. "I too was thinking about Microsoft's RROD situation when typing that about Amazon. You know good and well that it did whatever it could to satiate all the retailers' needs during that time, no matter the cost. It must, or it risk losing its support once the situation is resolved!" It's actually interesting, because it was also retailers that really helped decide the market between Blu-ray and HD DVD when that battle was forming up, with Microsoft of course going the HD DVD route. As for Sony, I think they have made some awesome relationships with third party developers in general, but I haven't really followed the PSN side, despite having a PS3. I haven't even downloaded any game to the PS3, other than the two free games I chose when Sony gave them out after the hack/crash. I need to relocate our PS3, but right now its main use is for Netflix, and Bean 1 plays LittleBigPlanet on it occasionally. This isn't exclusive to Sony though - I've done the very same with all of the digital networks, including Nintendo's. I'm not a big fan of core AAA titles, for the most part and that goes for all of the major publishers. I've always been a massive third party and niche gamer, which today is better known as an "indie gamer" for the most part. Yes, I play a good deal of the major titles, but even with Nintendo, I'll take another HarmoKnight, Super Mario Bros. 2, Luigi's Mansion, Drill Dozer, Pushmo and/or WaveRace over another The Legend of Zelda or New Super Mario Bros. title any day; I simply don't fall into the mainstream flow of the games industry. Insomniac Games is an often misunderstood developer. Sony owns its Ratchet and Clank and Resistance IPs, but the developer has never been acquired by Sony. When it went off to do its own thing, I was quite happy for it, as Sony started running its franchises into the dirt, but neither Outernaughts nor FUSE impressed me a bit. It is bringing more Ratchet and Clank to the PS4, as well as working with the Xbox One, but even with this I fear that the company is stretching itself thin by doing this. I hope I'm wrong, because it is one of the most talented studios left in the industry. Awesome, detailed piece here. I knew some of this - but not all of it. Interesting - I never considered whether or not pre-orders were being taken by everyone at the time, you just sort of assume it is. I've got my Windwaker bundle on pre-order with Gamestop paid off though. Yay Christmas present! Yeah, I'm just surprised that Sony didn't keep Insomniac on board at the PS4's launch, or shortly after, with another Resistance game or even their Xbox One game they're doing. The Call of Duty series really didn't TAKE off, until this gen. But I do know Insomniac had mentioned wanting to do new things after Resistance. We actually have an Insomniac office nearby, one of the two in the U.S.
Mrs. Coffee took a picture of it a few months ago for me, because it's close to where she does some grocery shopping. On the indie side though, I'm glad to see the console manufacturers not just allowing indie games on them now, but approaching them in a more aggressive fashion as well. Rage of the Gladiator was I think my most played WiiWare game, and thought it was a steal of a price when they released it. Yeah, it's just odd not seeing systems AND eShop cards on the site. I mean, the digital cards from Microsoft and Sony are in the "Top 100" as basically placeholders on the site. When the new Wind Waker HD bundle comes out, I expect it to be $350, or more, on Amazon.com this holiday season. How will that look for consumers that might see it advertised at $299.99? What about the regular Wii U consoles that will be down to $299.99 as well, will they finally reach that by third party vendors, or be slightly higher than that during the holidays? Anyway, glad you got the Wii U bundle paid off! I preordered both of my original Nintendo 3DS game consoles through Amazon. I preordered the Wii U through Amazon until it got cancelled. So I had to give my business to GameStop instead - a business I don't like giving business to. It would be interesting if an investor could pipe up and ask about the Amazon situation. It's funny you mentioned an investor, because the last two investment meetings I have tried to get through with the question, but my schedule never allowed me to do it when needed. I'm not sure when the next investor's Q&A is, but considering they ask about all sorts of questions. I would imagine this one would be a top priority to ask about, if more realized exactly what the situation was with Amazon.com not carrying the products directly. I don't think it reflects well for consumers to see your products with continuously higher MSRPs, when you are advertising your products with lower MSRPs.